If another player have "C051 Fishing Net". Can I use the "Fishing" accumulation space when I have no food ? Can I sow 2 wood when I get "You also get a 'sow' action for exactly 1 feild" from "A115 Chief Forester" ? Can I sow 2 wood when I get "You can sow crops in exactly 1 field" from "D115 Fodder Planter" ? Is not wood crop ? Is another space as count as 1 empty field ? We do not all have pictures of the cards you are reading. If you want rules clarifications, we need to know what cards you are using. Please provide the full card texts. 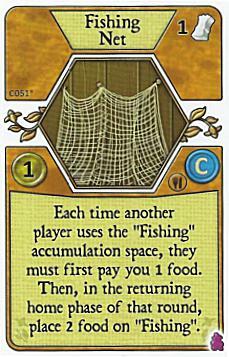 Each time another player uses the "Fishing" accumulation space, they must first pay you 1 food. Then, in the returning home phase of that round, place 2 food on "Fishing". 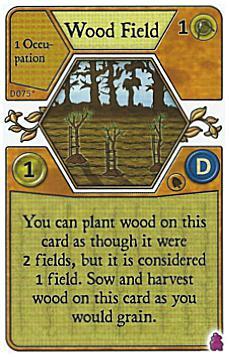 You can plant wood on this card as though it were 2 fields, but it is considered 1 field. 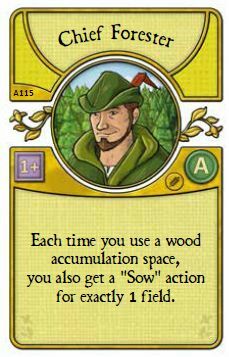 Sow and harvest wood on this card as you would grain. Each time you use a wood accumulation space, you also get a "Sow" action for exactly 1 field. 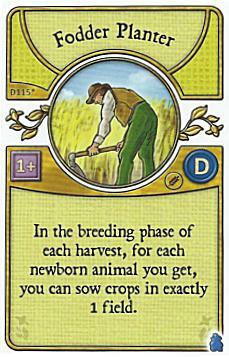 In the breeding phase of each Harvest, for each newborn animal you get, you can sow crops in exatly 1 field. Can I sow 2 wood for "D075 Wood Field" when I get "You also get a 'sow' action for exactly 1 feild" from "A115 Chief Forester" ? Can I sow 2 wood for "D075 Wood Field" when I get "You can sow crops in exactly 1 field" from "D115 Fodder Planter" ? Fishing Net: No. You must first pay them and since you cannot do it, you cannot use the action space. Wood Field works with Chief Forester but does not work with Fodder Planter. Wood is not a crop. A field containing a good is not empty.